yep the finish on the fireman pg owns looks much darker in the video's and pictures. 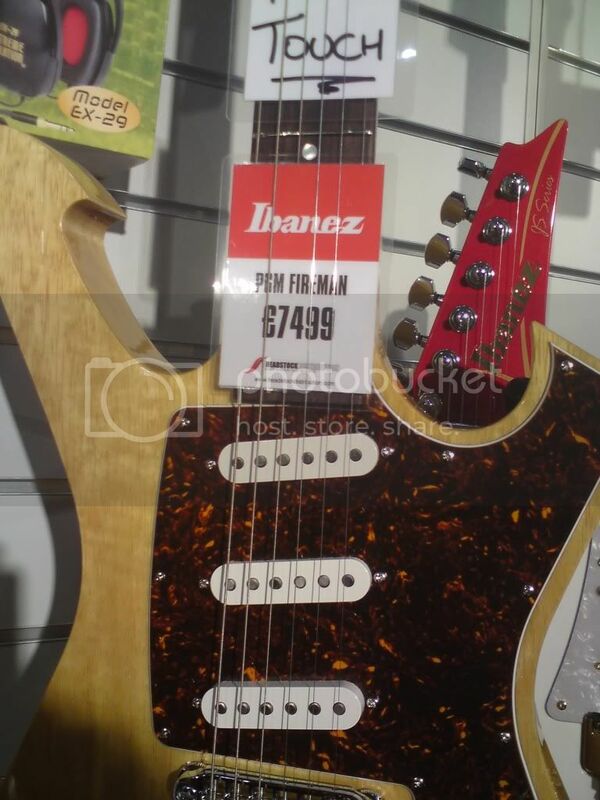 You would think that Ibanez would try to get the color right on a guitar with a 10K list price. Pauls guitar is a totally different color. Maybe they got lazy because only 5 FRM2's are being made and decided to just clear coat it instead of staining the wood or tinting the lacquer or whatever they sprayed on it. At the price they are charging they can afford to do it right. Ibanez has been going downhill lately. Last edited by flying-dino on Sun Sep 27, 2009 5:58 am, edited 1 time in total. I don't understand what scale is used on the Fireman. Many websites give different specs concerning it. Is it a 24,75" or a 25,5" ??????????? The official specs shown on the Ibanez website say 24.75"
Grrr I'll have to inform Jaden of this. I saw a video of Paul saying that his fireman was a 24.75" scale.. I measured the sclae length at 24.75"
any links to pages that state a 25.5" scale ? I don't remember where I saw these specs with 25,5" scale but I saw it. I think it was a mistake and the correct scale is 24,75" as it appears in the ibanez PGM fireman page. I'm considering building a custom fireman. Do you think it would sound great also with a neck thru instead of a set in neck ? They allowing noobs to play on it? Last edited by flying-dino on Mon Jul 06, 2009 12:54 am, edited 1 time in total. (because the 'special characters' on my keyboard don't work, I have to type this out the long way) -- I thought the GBP was an L shaped thing and the Euro was the E shaped thing. In the picture it's clearly an E shaped thing... but whateva, no big deal, it's marked up too much to sell it! Most collectors won't willingly overspend. £ isn't so much L shaped. There's a string blocking the bottom right angle. It's GBP. A brit would know. LOL! Why do they have it marked up that high? You can get them for like 5000E (about $7000). Heck you could buy one of the FRM2 for less then that! It probably costs more because of things like import duties or taxes. The distibutor might have to pay those fees when they import the guitar. Then they pass on the cost to the consumer so they can still makea good profit. Gibsons also cost quite a bit more in the UK than they do in the US. If a collector bought one from overseas they might have to pay the extra fees, so it might not save them that much money.